Using the right corks is crucial to prevent leakage while storing wine bottles. But it also effects the ageing process tremendously as well as the taste of the wine. Therefore, we will give you a brief introduction on corks and corking equipment as well as on the debate whether corks should be soaked in water before corking. Natural corks. They are made from the cork oak and cut directly out of the bark slices. The picture below shows how this process is done and how the finished natural cork looks like. The cork quality is identified by a grading system based on the visual quality of the cork. This includes the proportions as well as the symmetry, thickness and wood quality. A quality cork facilitates corking as well as serving as a good seal for storing over a long period of time. Of course, the different qualities have their price ;-). Agglomerated cork. This type of cork is manufactured from tiny pieces of chopped cork, bound together by glue. It’s mostly made of cork leftovers that - when formed into a cork with glue – can be sold on the market instead of being thrown away which is the motive behind producing these types of corks. Synthetic corks. 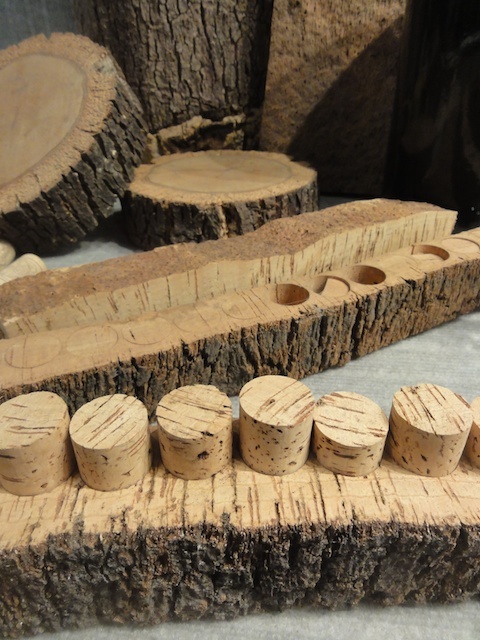 These corks are made of soft synthetic material and have been conquering the cork market more and more in the last several years due to the lower price and the better storability compared to natural cork types. Although, it is yet unconfirmed what effect synthetic corks have on the ageing of wine since there have been rumors of flawed material which led to low quality results in storing wine. But choosing the right cork should not only be a matter of price, but good intuition of what types of cork best work with your wine! After all, natural cork is still the most used and recommended. Many corking devices exist on the market, yet not all are as effective as they should be. We have several corkers in our assortment which we have tested successfully whether you only have one bottle to cork up or many. Handy corker (Verlinken). This model is best if you don’t have many bottles to cork up. Simply cork bottles with the palm of your hands. It’s also suitable for synthetic corks. Double lever corker (Verlinken). This is an affordable corker that saves you a lot of time if you have many bottles to cork up. The metal design is sturdy and it’s well-balanced for corking evenly. Floor corker (Verlinken). These types of corkers offer safe support due to the sturdy metal construction. Cork bottles with ease and without deformation of the corks. The corker can even be adjusted to different bottle sizes (from 750 ml to 1,5 L) and be used with different types of corks – synthetic, natural cork or half synthetic with natural ends cork. It’s a good way for corking many bottles within a very short period of time. We are often asked whether it is necessary to prepare corks before bottling. Well, this debate has been going on for quite a while and yet there is no end in sight. High-quality corks are often used to cork without prior preparation while classic and more favorable corks are normally soaked in lukewarm water, especially if they have been stored outside of a container for a longer period of time (months). To achieve a suitable softness for corking, the methods vary a lot. Some steam their corks for 2 – 3 minutes before corking while others only soak or even dip them in lukewarm water. This may result in the corks being exposed to unwanted bacteria which might contribute to an unpleasant off-taste in wine while storing. To avoid this contamination, potassium or sodium metabisulfite are added to the lukewarm water. It is then diluted with the water according to the instructions on the packing and then the corks are soaked in this solution until softness is given. This mixture sterilizes the corks so that unwanted substances or bacteria cannot contaminate the wine.